If you’ve been anywhere in Westwood, Venice, or Santa Monica lately, you’ve likely seen—or been nearly run down by—a Bird scooter. The app-enabled, Santa Monica-based rental service launched in the fall and quickly became a hit with tech workers, savvy tourists, and UCLA and Santa Monica College students. As a Bird spokesperson says via email, “Demand for Bird is high and those who ride Birds love them, so we see a lot of opportunity for growth here.” What’s been unclear so far is whether the greater L.A. area is ready. As the public took notice of Bird—with over 50,000 people hopping on for a dollar a ride plus 15 cents a mile since the company’s launch—Santa Monica officials struggled to regulate the service, which allows users to drop off the scooters wherever they please, assuming the devices are not blocking driveways or endangering the public (the electric contraptions don’t move without an app code and are picked up by trucks every night by 8 p.m.). In early March, the city passed an emergency ordinance that allows it to impound any scooters abandoned in places that limit access or imperil safety. The city and the company are working on making peace—Bird even paid a $300,000 settlement in response to a lawsuit that accused the company of not obtaining the proper permits. Officially, the law dictates that Bird riders are supposed to wear helmets and ride in the street or bike lane. Bird offers free helmets to riders who don’t have them, but given the choice between braving traffic on Wilshire or risking getting a ticket for riding on the sidewalk, riders will tend to choose the latter. At least one collision between a scooter rider and car has been reported, and Santa Monica police are “aggressively” ticketing sidewalk riders to prevent collisions with pedestrians. Santa Monica does have incentive to make it work with Bird, as the city—and the region as a whole—tries to encourage more walking, biking, and transit use. The Birds are perfect solutions to the “first mile/last mile” problem, getting people from their homes to a bus or train stop, or from a bus or train stop to their final destinations. That issue of final connection has befuddled Metro, which has seen its ridership steadily decline during the last few years. Metro and other area transit providers have not found viable ways at moving people around short distances. The L.A. area is filled with different bike rental kiosks that are not compatible (UCLA, Santa Monica, and Metro all have different systems); most neighborhoods and train stations don’t have any options for renting a bike. Even parking a bike at Metro stations can be a challenge. 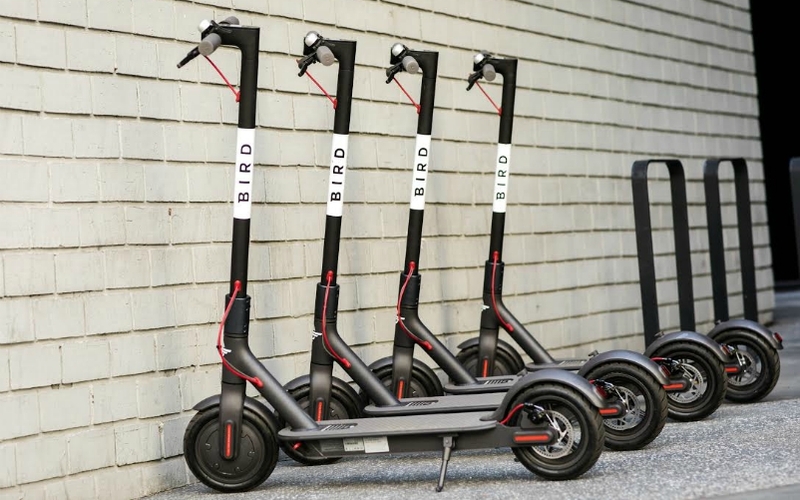 Birds are currently available in Venice, UCLA, Westwood, Santa Monica, and San Diego, and the company plans to be in 50 markets by the end of the year, according to a spokesperson. Los Angeles officials will have to figure out if they’ll play nice when Bird inevitably pitches itself to City Hall. Just like Mayor Garcetti and LADOT head Seleta Reynolds, Bird founder Travis VanderZanden says he’d ultimately like to see fewer cars on the streets of L.A.
RELATED: Could These Little Scooters Be the Future of People Moving?